El Paso Holocaust Museum | Remember. Reflect. Respond. 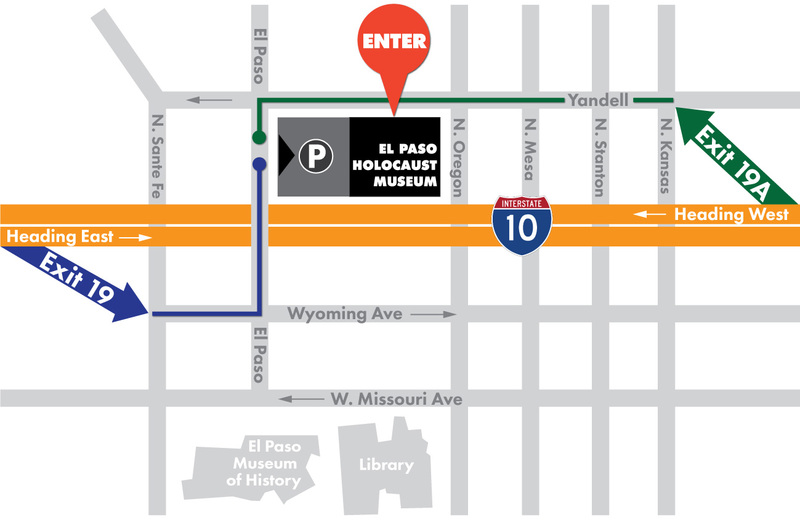 Welcome to El Paso Holocaust Museum and Study Center conveniently located in the museum district of downtown El Paso. We are proud to be the only fully bilingual Holocaust museum, and one of only 13 free-standing Holocaust museums in the United States. The mission of El Paso Holocaust Museum and Study Center is to teach the history of the Holocaust in order to combat prejudice and intolerance through education, community outreach, and cultural activities. Visit the museum today to find out how you can help or call us at 915-351-0048. Bienvenidos al Museo y Centro de Estudios del Holocausto de El Paso, convenientemente ubicado en el distrito de los museos del centro de El Paso. Estamos orgullosos de ser el único museo completamente bilingüe del Holocausto, y uno de sólo 13 museos libres del Holocausto en los Estados Unidos. La misión del Museo y Centro de Estudios del Holocausto de El Paso es enseñar la historia del Holocausto con el fin de combatir los prejuicios y la intolerancia a través de la educación, el alcance comunitario y actividades culturales. Visite el museo hoy para saber cómo puede ayudar o llámenos al 915-351-0048. Be sure to check out our other events happening at the museum on our Events page. This is Bernard Pergricht and in this short video he shares his reflections about the Holocaust. In 1941, his parents and young wife were deported from Poland and sent to concentration camps in Auschwitz where they were killed. He was sent to a labor camp which was liberated by the American army in 1945. Bernard came to the US in 1952, and later to El Paso in 1978. You can read his bio and see more of his video testimonies here. All self-guided tours must begin 30 minutes prior to scheduled closing times. Also, please check here for holidays in which the museum will be closed. Thank you. Admission to the museum is free, but donations of any amount are appreciated. Thank you. Directly Adjacent to Museum at corner of Yandell Dr. & El Paso St.
On Yandell Dr. Between N. Oregon & El Paso St.